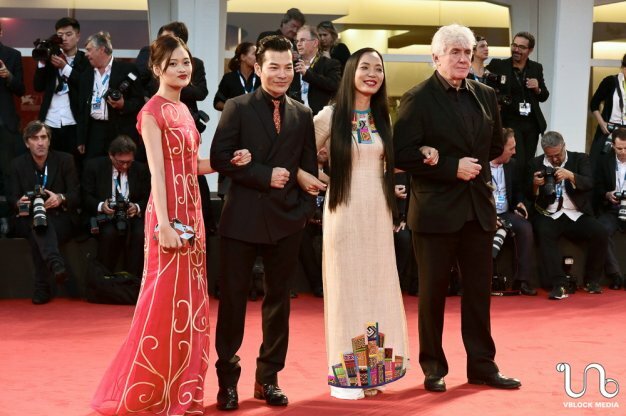 From left: 'Dap Canh giua Khong Trung' (Flapping in the Middle of Nowhere)'s main actress, actor, director Nguyen Hoang Diep and French co-producer Thierry Lenouvel- one of Europe’s most prolific co-producers- on the red carpet of the 2014 Venice International Film Festival. A film by a Vietnamese female director has beaten seven other debut features from other countries to win the critics’ award at the 2014 Venice International Film Festival, which closed yesterday, September 6. “Dap Canh Giua Khong Trung” (Flapping in the Middle of Nowhere), by 32-year-old Vietnamese director Nguyen Hoang Diep, won the Best Film at the Venice Film Festival’s International Critics’ Week, a program for debut films. The film, which was screened at the festival on September 1, 2 and 3, received notable critical acclaim from foreign critics for its richly poetic cinematography and detailed, vivid depiction of urban life. Produced by VBlock Media, a local company, in coordination with its French, German, and Norway partners, “Dap Canh giua Khong Trung” revolves around Huyen, a girl who needs money for an abortion after her boyfriend deserts her. She then turns to a transsexual close friend for help and begins to find happiness with a man who has a special weakness for pregnant women. While her film won the award at the Venice Festival yesterday, Diep was present at the 2014 Toronto International Film Festival, running from September 4 to 14, to attend the screening of her film at its Discovery category. Though the film was screened quite early in the morning, Diep gladly shared that tickets, which were quite expensive, were almost sold out. The director hoped that her film would win an audiences’ award. “Dap Canh giua Khong Trung” was screened and earned critical acclaim at the 2014 Cannes International Film Festival. It will likely make its debut screening to local audiences at the Hanoi International Film Festival, to take place in November 2014. Diep was first invited to the 2012 Cannes festival as the producer of internationally-winning film, “Bi, Dung So!” (Bi, Don’t Be Afraid! ), which also won the SACD and ACID awards at Cannes Critics Week. She also took her film project “Dap Canh Giua Khong Trung” to Cannes at the invitation of the Cannes’ La Fabrique des Cinemas du Monde (Filmmakers of the World) organizers, only aiming at seeking co-producers from Europe, particularly France. Producer Thierry Lenouvel, of Paris-based Cine-Sud Promotion, one of Europe’s most prolific co-producers, agreed to be Diep’s co-producer on the condition that within one year, her film project would apply for four major European film funds, and get sponsored by at least two of them -- a far-fetched goal for a young director’s debut film. To everyone’s surprise, within one year, Diep’s “Dap Canh Giua Khong Trung” got sponsored by several international funds including the Berlinale International Film Festival’s World Cinema Fund of Germany, Cannes International Film Festival’s World Cinema Support of France, Norway’s Sorfund – the largest film fund in Northern Europe – and France’s Fonds francophone de production audiovisuelle du Sud. During her third trip to this year’s Cannes festival in May, Diep hosted an exchange with young film directors and producers selected by the Cannes “La Fabrique des Cinemas du Monde” category, which also chose her film project at the 2012 Cannes event. Her “Dap Canh Giua Khong Trung” film was also screened at the 2014 Cannes. One of her short films (Hai – Tu – Sau) (Monday – Wednesday – Friday) was also selected for the Cannes Court Metrage (Cannes Short Film Corner) category in 2012. Diep’s other works include well-loved teen TV dramas “Chit va Pi” (Chit and Pi) and “Bo Tu 10A8” (The 10A8 Quartet).